H.H. Acharya Mahashraman, today visited the huge campus of A.P.S. public school for one day stay. His holiness preached audience and said that detached souls are free from all wishes, desires, charms and greed but the normal souls are more or less filled with characteristics like desires, greed, lust, lure etc. Sky is infinite. It doesn't have any ends, But at times, desires grow even higher than sky. People of all type and all age groups have wishes. During Non Violence March (Ahimsa Yatra), H.H. 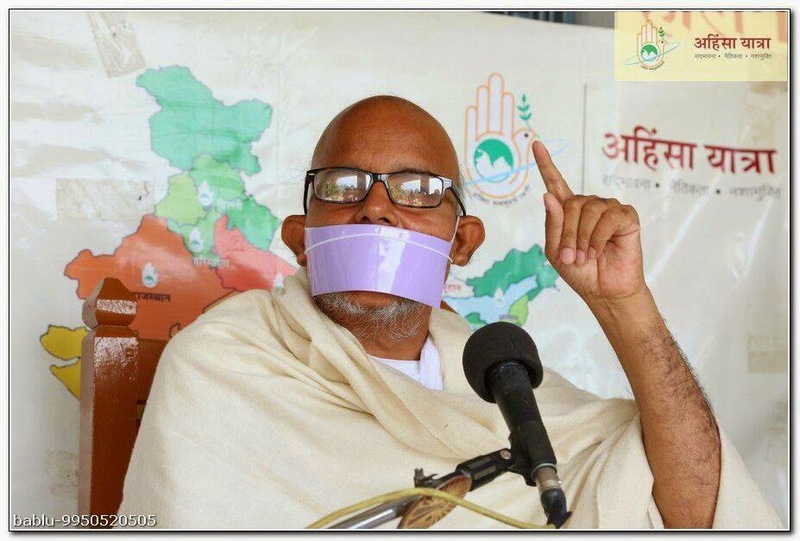 Aacharya Shri Mahashraman Ji, at Gazipur Uttar Pradesh. A poet has rightly said that body festered, hair greyed, lost teeth, grown old and has to take support of stick to walk, still is not free from yearnings. Even saints and sages are not free from urges. Those, who practice five fire penance in summers and do bare body meditation in winters, are even engrossed with urges and longings. Because of these desires we keep taking rebirths and die. We bear pains and grievances during gestation but still we are not able to get free from our urges, greed, desires, lust, longings and dis-satisfactions. Greed is the principle reason of all grievances. Hence, we should keep a check on our desires, allure and yearnings. In the beginning human consumes and controls material, later he himself gets subsumed. Greed never ages, we only grow old. Greed is father of all sins. Allure is the prime reason behind all grievances. Hence we should keep a check on greed, allure, lust, desires and longings. Regarding yearning control, Acharya shri said that if we cannot become completely desire free, we should not even become greedy. we should try to have minimal wishes. Satisfaction gives supreme pleasure. Literates and wise people keeps themselves content. But unsatisfied people always live in disguise. We should always be pacified with 3 things : 1. Spouse, 2. Food, 3. Wealth. We should never be content with 3 things : 1. Studies (learning), 2. Chantings, 3. Donations. Thus, practicing contentment is vital. Saadhvi Charitrayasha Ji and Muni Raj kumar Ji sang beautiful psalms. TYP members from Balotara sang 'Darshan paaye re'. Mr. Dilip from Panchpadra also sang a sacred song.. Date : 06/03/15, Place : Gazipur, Uttar Pradesh.